Slow Food UK is incredibly proud to have Ark of Taste producers like Rae Phillips from Barony Mills on board. Please read more about Rae and his forgotten food Beremeal below. 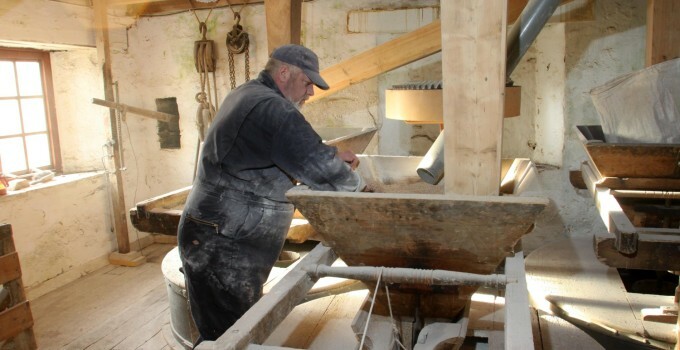 Milling is in Rae’s blood as both his grandfather and father were millers at Barony Mills between 1910 and 1972. Having worked for his father between 1957 and 1963, Rae returned to be the miller for the Birsay Heritage Trust which has operated the Mill since 1998. Since the Mill was built in 1837 it has remained relatively unchanged and Rae prides himself in using the same machinery and techniques used before him to make the Beremeal he produces today. Producing a high quality product while preserving traditional milling techniques is very important to Rae. Rae makes Beremeal, plain and simple. A favourite recipe of Rae’s is the Scottish classic – Bere Bannocks.